In the days of reaching the moon, we amazed ourselves with the mathematical capability we empowered our machines with. Apollo's 32kg guidance computer was basically 2Mhz and it's memory measured in kilobytes, and gave Neil Armstrong a cryptic memory error just seconds from landing on the moon. It used to be said that the apollo spacecraft technology is blitzed by "today's" vehicles. Well, today's vehicles are way ahead now, and we can find electronics that exceed Apollo computing power everywhere. This article compares the guidance computer to a 2009 smart phone. I tried to find the exact specifications for something less conspicuous like anti-lock brakes but alas. Where am I going with this? Recently I was cleaning out the extended garage and found an old computer I was yet to dispose of. This was partially due to nostolgia, and another part of me thought I might be able to find some use for it - well, I did find a use - amusement. As I pulled it apart, I thought I'd take a few photos and document the occasion. It was dated 1999 so I imagine this is what got me through university. I know 1999 isn't exactly looking through a wondrous time portal, but it was enough to keep me amused for a while - amusement which started with the 5 1/4 inch disk drive! 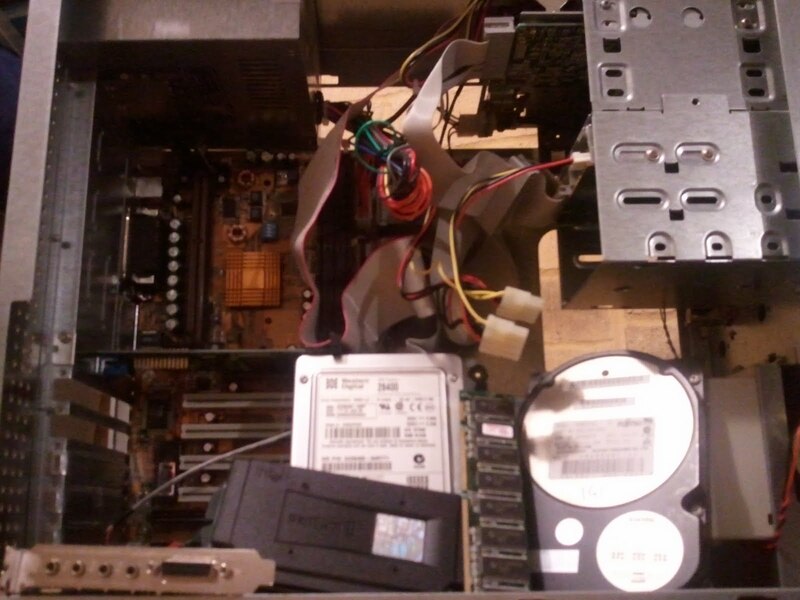 Looking in the guts I'm surprised at the lack of a modem, unless I moved that 56k beast to a different pc. Another look at the front shows it is a bit of a mutt, with cd drive upgraded to dvd & pasty old disk drive installed to pilfer data off old disks. The computer belonged to the era where hard disk space was doubling and this affected what (and the amount of) software you could install. Today, space requirements for software such as your operating system is simply absorbed into the mass amount of storage available. I could tell you DOS6 fitted on a handful of 3.5" disks, I can't tell you how much Windows 7 now consumes. Yes, my first computer was an XT using DOS 3ish. 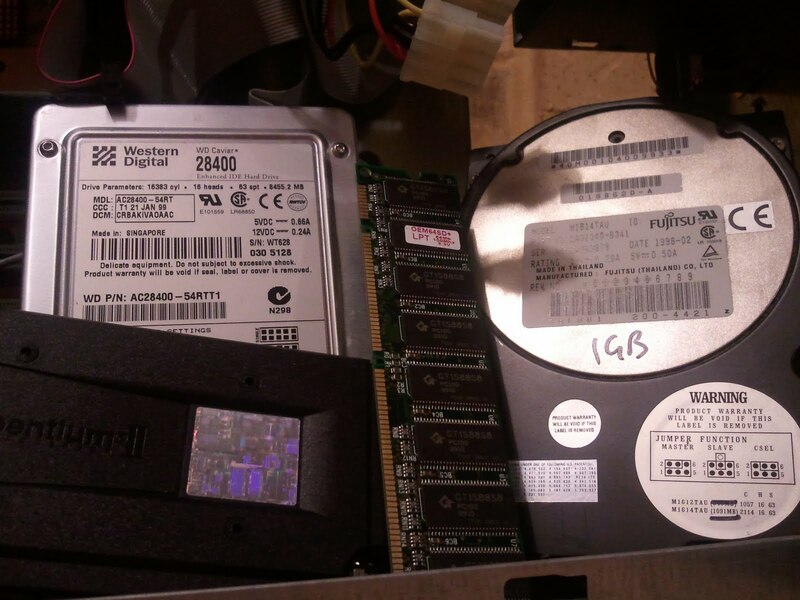 Here is a fuzzy look at the mutilated insides, the close-up shows the original 1GB HD, and the 8GB upgrade, with the Pentium II core and 64mb RAM. 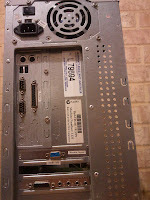 The back of the PC shows the March 1999 build date, with pride by PLE Computers - our local mainstay. I just noticed the whopping 2 USB ports, wasn't much need for them back then, because at this time for data transfer we all used ZIP drives. A nice 100/250mb of data in the one iomega disk, great for holding (and potentially losing) all my university work. I was prudent with my backing up - apart from theft and stupidity, with excessive use we also had to avoid the click of death, which (why should I be surprised) you can listen to on Wikipedia. And on a side thought, one of the podcasts I listen to talked about how much data capacity exists around the world (if that's the right phrase to use) - a result of some study. A secondary finding to that was much of the world's data is redundant. Isn't that a fascinating conclusion, but when you think about it, it becomes completely obvious. We are all consumers of data, downloading what companies around the world have to offer. We also share information - music, videos, photos - all of which could easily be replicated on multiple computers, backup disks, internet servers. I'd like to know how much purely unique data might exist out there? Perhaps a mass amount - I wonder how much the LHC would produce in a few minutes? Man you're young! The first computer I owned was a "portable" Osborne 1 that weighed in at 32 lbs, had 64k of memory, dual 92k floppies and a 5" diagonal screen (displaying 52 characters per line). But I could take it to a customer site and school (though my classmates told me the typing drove them nuts). But it let me learn the craft of programming and got me working in the field. 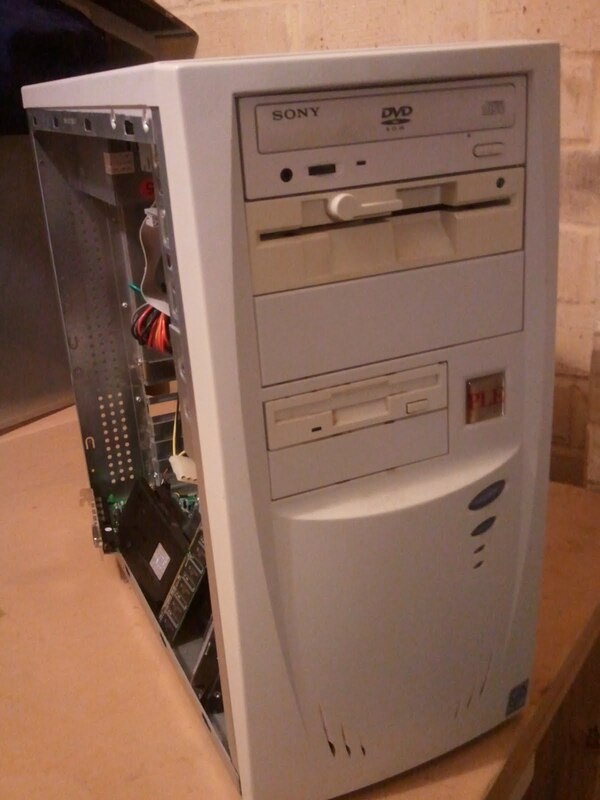 Maybe not quite that young... this was my uni computer. The first in our family was a variation of an IBM XT. I remember dad upgraded the hard disk from 30mb to 40mb, and managed to wrangle a deal on a great dot matrix printer. Oh, and that didn't count the Commodore VIC-20, where I guess I had my first programming experience peeking & poking with BASIC! 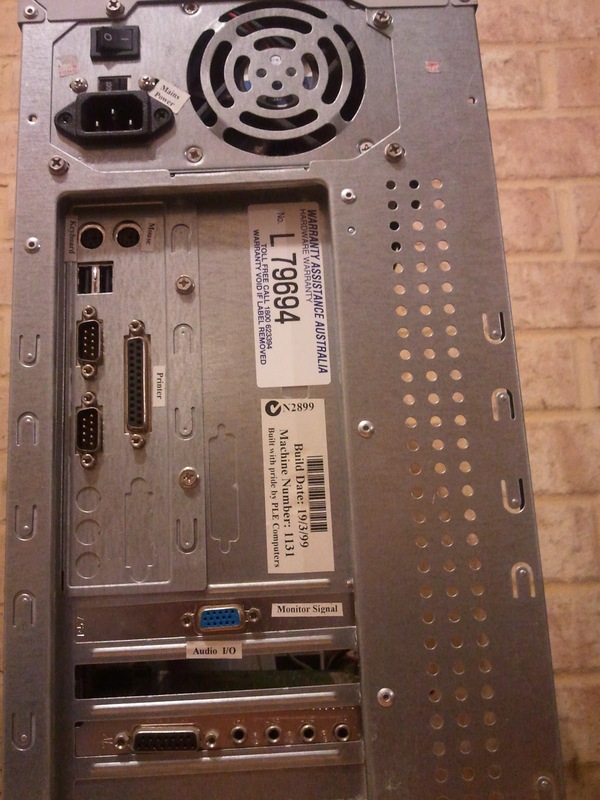 The first computer I spent any hours on was my private high school's DEC PDP/8e that some rich alumnus had donated (new it'd had cost $20 grand). It had up to 3 paper terminals, small magnetic tapes and 8 KB of memory. I learned to program in DEC BASIC on it. You booted it up by toggling in a sequence of a dozen octal numbers using the switches on the front.